Some secrets are better left buried. A bit like this film, really. A police detective (Keanu Reeves) investigates the truth behind his partner’s death. 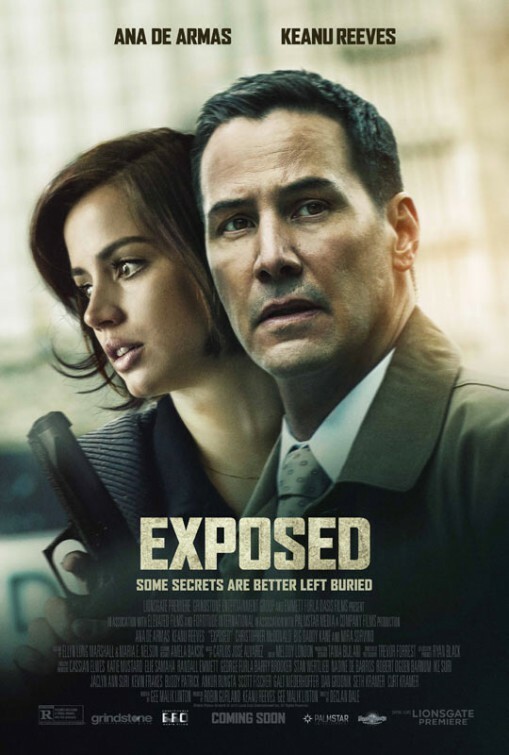 A case that unearths disturbing police corruption and a dangerous secret involving an unlikely young woman (Ana de Armas). Or so the synopsis would lead you to believe. Thank God, Reeves has got John Wick to fall on because this coma-inducing effort would have been a career killer. If you haven’t heard of this film, then GOOD. You’re one of the lucky ones. If you were thinking of giving it a go, I would strongly advise against it. Maybe Armas and Reeves shouldn’t work together on a project again. Fool me once, Eli Roth’s horrendous Knock Knock. Fool me twice, this monstrosity. The opening was creepy enough as Armas loitered around an empty subway. An air of unease uncomfortably set. The Shining-esque tunnels. The strange visions. A shame that momentum couldn’t stick. I haven’t seen something so dull and disjointed in a long time. I expected a slow burning supernatural thriller BUT was rewarded (I say rewarded) with a questionable mess that never really got going. The alluring Armas (What?) did her best with the part BUT it just didn’t work. If it wasn’t for the strange dream sequences and that crazy albino woman, I would have switched off from the get go. What drove Keanu to do this? He was laughable. His stone cold pallor and incessant mumbling did nothing for his character. A disgruntled detective out on the trail to avenge his murdered partner. His story line felt it should have been in another movie altogether. It ran completely separate to Isabel’s story. They didn’t even cross paths until the very last frame. And by then, you wondered why he was in it in the first place? It was so boring, cliched and full of plot holes. His investigation consisted of grunting, slapping some people about and getting jiggy with his partner’s grieving widow (Mira Sorvino). Sorvino (Mimic) was terrible. Her character’s unhinged and volatile behaviour made her extremely unlikeable and really bloody annoying. She brought nothing to the mix. Big Daddy Kane’s slimy gangster Jonathan ‘Black’ Jones was completely unnecessary. He swaggered around, bumping people off left, right and centre that had nothing to do with Reeve’s investigation or Isabel. There was a bizarre and surprisingly violent encounter between Jones and Isabel’s brother-in-law. BUT was there any explanation? Any relevance to what was going on? Nope. And that was the main problem. In terms of story telling, there wasn’t any. Gee Malik Linton just seemed to throw in any old thing, hoping it would stick and make some sort of movie. Just question after question with no answers. It just got stranger and more disjointed as it slowly crawled (Bearing in mind, it’s only 98 minutes long) to its abysmal finale. Isabel immaculately conceived a baby. Weird considering her fella was in the army and hadn’t been back on leave in over a year. The whole religious connotation to the Virgin Mary came off so hammy that even her family weren’t buying it! Reeves’ Galban just slept walk through this film, blurting some school boy Spanish here and there was one scene that had me in stitches . . . It was supposed to add a bit of depth to the broken man. Drunkenly calling his son late at night just for someone to talk to. Isolated and alone. BUT what does our hero do after this failed attempt at emotional bonding? He slaps himself repeatedly with the phone, of course. I wish I could find a GIF for it. And considering the synopsis suggested corruption. I didn’t see any in this film. Christopher MacDonald (Happy Gilmore) was completely wasted in the generic role of Lieutenant Galway. Repeatedly telling Galban to drop the investigation. I really wish he had taken his advice. The last 10 minutes finally explained those bizarre visions (which did surprise me). I will admit I didn’t see the twist (I say twist) coming. A twist that ultimately led to a highly unsavoury scene. BUT once I got that over initial and shocking scene, the film then capsized even further as everything came to a befuddling and dismal ending. I actually couldn’t care by the time the credits rolled and will spend no more time after this review looking into it. I urge you to do the same. Awful. AVOID. Unless you really, and I mean REALLY, have nothing better to do.